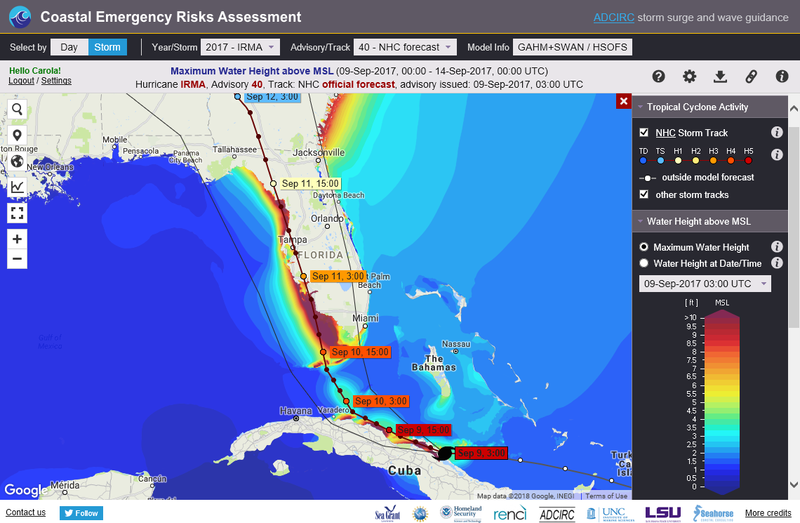 The CERA live storm surge mapper was used to explore ADCIRC model guidance by a variety of federal, state, regional and local organizations, including National Weather Service offices, the U.S. Army Corps of Engineers, Federal Emergency Management Agency and the U.S. Coast Guard during and after Hurricane Irma 2017. “The model was key to my decision regarding aircraft protection in Puerto Rico, and our decision to relocate our command center out of Miami. I’ll be watching it with every update,” said U.S. Coast Guard (USCG) Rear Admiral Peter Brown, Commander of District 7, which includes most of Florida, Georgia and South Carolina. He used ADCIRC results to plan for evacuation of USCG staff during Hurricane Irma.